Hub-mounted odometers for cars and trucks. Homepage. This page: Before speedometers and mileometers were in widespread use, hub odometers were a possible option. Owners of all classic cars, and many pre-war cars, take "mod cons" such as the speedometer and mileometer for granted, yet in the era of the Great War, such conveniences were far from widespread, especially on cars made for the masses. If you needed to keep an eye on your mileage, perhaps as the operator of a commercial vehicle, or perhaps a car-sized vehicle such as a taxi cab, then a bolt-on gadget such as those shown below could have been the answer. Equally, if you were in the business of building commercially-operated vehicles, then you may well have considered fitting these Odometers at the factory. Both units were designed to meet the need for accurate mileage recording, and each appears to function in a similar way to the other. The odometer shown to the left was produced by the American Taximeter Co., of 16 West 61st Street in New York, and sold under the name of "Dreadnaught". We're told that it ".. goes on like a hub cap - no drilling no pinning", and was Indestructible. Presumably various versions were sold, depending on the wheel stud pattern of the vehicle it was being fitted to, and the overall rolling diameter of the wheel and tyre combined. Are any still in use on preserved vehicles of this era? The two vintage odometers featured were both advertised in a motor trade magazine in 1919. 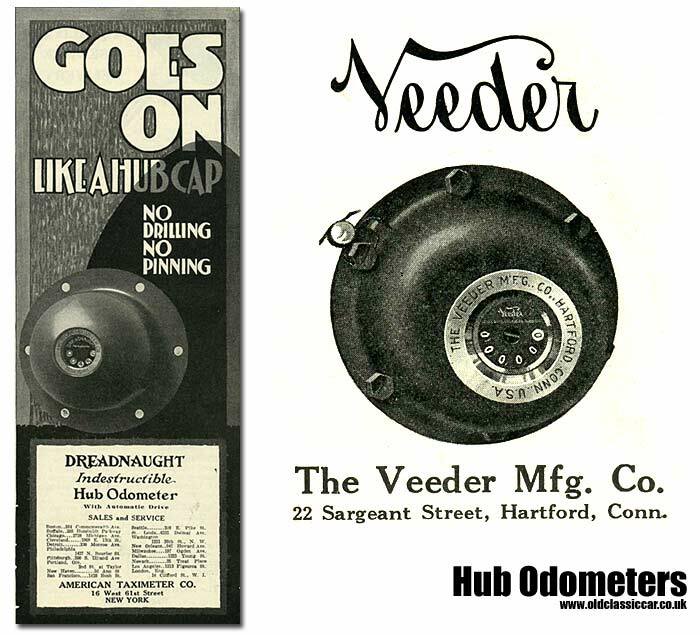 The second odometer was produced by the Veeder Manufacturing Co of Hartford, Connecticut, and their advertisement goes into greater detail about the benefits, to builders of trucks and vans, of using their product when building new vehicles. The manufacturer who decides to furnish his trucks with Hub Odometers has a good deal at stake in his choice of a Hub Odometer. Unless he picks an instrument of steadfast accuracy, it will not for long tell the truth about his product or its performance. The very operating economies of the Odometer is supposed to indicate may be refuted by failure to register full mileage, and so the truck builders who have pioneered in equipping with Hub Odometers and profited by it practically all use the Veeder. The reason lies in the Veeder recording mechanism; in sturdy, shock-proof construction. The Veeder is built for enduring accuracy under wear and vibration, and nothing about a good truck is built more to that purpose. Always registers mileage forward, whether truck runs forward or backward. Regular model, adaptable to all standard trucks, $20. Special model for FORD Trucks, $15. Write for particulars and list of equippers. If anyone can help with a photo of a vehicle fitted with just such a hub-mounted odometer, please send it over and I'll add it in here, thanks.